For as long as I can remember I’ve wanted to run my own business in San Francisco. A few years after I moved to the city, after a lot of jumping through visa hoops, I finally have the opportunity. After four months of development and iteration, I’m excited to release Sourcing.io, a tool to help you find and hire talented software engineers. The idea stems from a problem that I had at both Twitter and Stripe: finding software engineers is a really hard and time consuming problem. There’s a shortage of good talent and the demand is incredibly high. It’s an incredibly inefficient process that can take months and cost you tens of thousands. To find engineers, I resorted to the process of manually going through my Twitter followers and reaching out to them one by one. Out of about a hundred people I contacted, we hired three. While I was happy with the conversion rate, I couldn’t help thinking that part of the process could be automated to save some time. Sourcing.io aims to solve that problem. 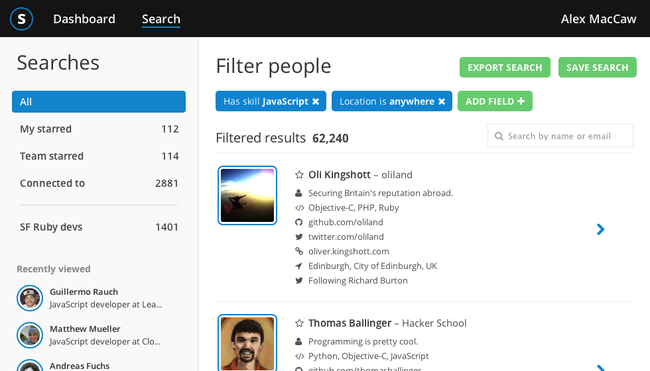 We’re a search engine for discovering engineers — we’ve indexed about four million developers on GitHub, StackOverflow and other places. You can search, cut and slice that data to find the exact talent you’re looking for. For example you can filter by location, skill, company and whether candidates have published any libraries like RubyGems. The key aspect to Sourcing.io is that we highlight any candidates that are connected to your team in some way, such as on Twitter or Facebook. Referral based recruiting is the most effective form bar none, and we intend to take full advantage of that. I won’t elaborate on the product too much, you can read more in the introductory post on Sourcing’s blog. Suffice to say I’m absolutely loving running my own startup, and working with my co-founder Richard. We’re already making money, and are lucky to have many of the top companies in the valley as customers. If you’re having trouble finding good engineers, then give Sourcing.io a spin.